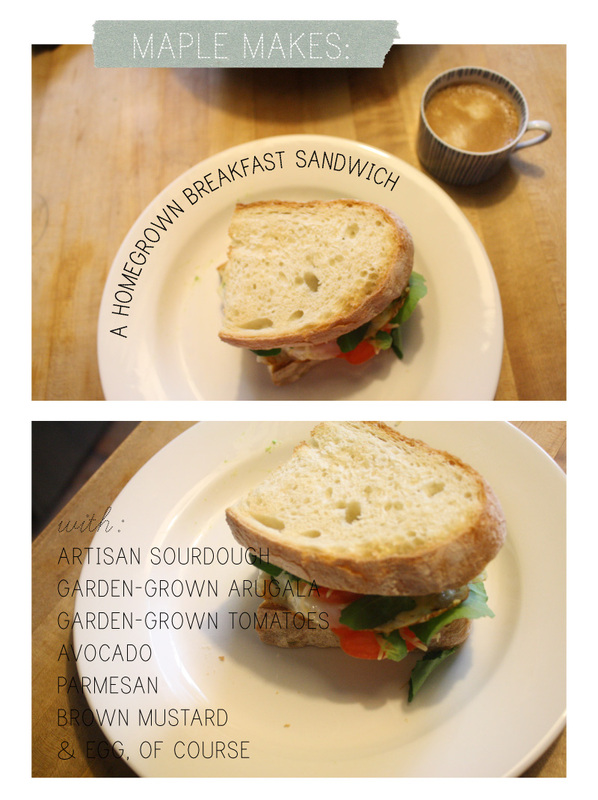 maple and shade: Good Eats: tomato, avocado + arugala sandwich. Good Eats: tomato, avocado + arugala sandwich. So, yesterday a good friend stopped by to *try* and help me salvage my sad-looking tomatoes (thank you, Helen! ), and with her she brought a handful of arugala, freshly snipped from her very own garden. Anxious to sink my teeth into the spicy green, I concocted a few homegrown breakfast sandwiches this morning with some staples in my pantry, garden and fridge. Oh, arugala--please hurry and grow. You are so very dang delicious. To make a sandwich like the homegrown one above, simply fry an egg or two, season it with salt and pepper, throw some grated parmesan on top along with a tomato and some arugala, and let it all sit in the skillet for a minute or two (until the cheese melts). Slather some spicy brown mustard on your choice of bread, and top it with what's in the skillet. Sliced avocado makes it especially creamy and delicious and really even out the spicy bite from the arugala and mustard. MMMM...that was a good sandwich!